As many of you may know, one of my assignments as a state senator is to serve on the board of the Idaho Health Insurance Exchange. As a result, I have a number of contacts in the health insurance industry. I am hearing that repealing Obamacare would result in significantly reducing the cost of health insurance. It would allow insurance companies in Idaho to sell insurance that meets the needs and desires of Idahoans. I spent half an hour with Paul J and Chris this morning. We talked about the progress on increasing hours for boat inspections to keep zebra and quagga mussels out of our waters, efforts to obtain the funds to address I84, among other issues. Tomorrow, Thursday, morning at 8:30 am I will be on KBOI. 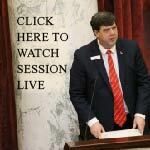 We will cover some of the things going on at the legislature. All of us who represent Canyon County are working hard to create a path forward in addressing the needed repairs on I84 in Canyon County. We are working to get funding to start widening immediately from Franklin in Nampa to the Karcher interchange. We hope to accomplish this before the legislature adjourns. CALDWELL — Republican incumbent Sen. Jim Rice defeated his Democratic challenger Ydalia Yado on Tuesday, taking 68.38 percent of the vote. Rice was the incumbent in the race seeking his fourth term. Rice took in 9,671 votes while Yado took in 4,472 votes, or 31.62 percent. During the campaign, Rice said his top priorities if re-elected would be excellence and choice in the state’s educational system, protecting private property and fostering a great climate for private business. Republican incumbent Rep. Brandon Hixon defeated Democratic challenger Jeremy Lopett with 67.01 percent of the vote. Hixon brought in 9,315 votes, while Lopett took 4,585 votes, or 32.99 percent. During the campaign, Hixon said his priorities include finding alternative ways to fund transportation, bringing higher paying jobs to Idaho and putting checks on wasteful spending. “I am an active listener, and I try very hard to bring outside the box solutions to some of the biggest problems we face in Idaho today,” Hixon wrote in a Press-Tribune candidate survey. Republican incumbent Rep. Greg Chaney took the over Democratic challenger Warren Stevens with 67.49 percent of the vote. Chaney is seeking his second term in office. Chaney brought in 9,376 votes while Stevens only had 4,517 votes, or 32.51 percent. Chaney’s priorities include jobs, career readiness and a government that is accountable, accessible and responsive. “I enjoy making a positive impact on policies that affect real people. Every issue, no matter how benign or contentious, is about people — people with very real hopes, dreams, challenges, and opportunities,” Chaney wrote in a Press-Tribune candidate survey.